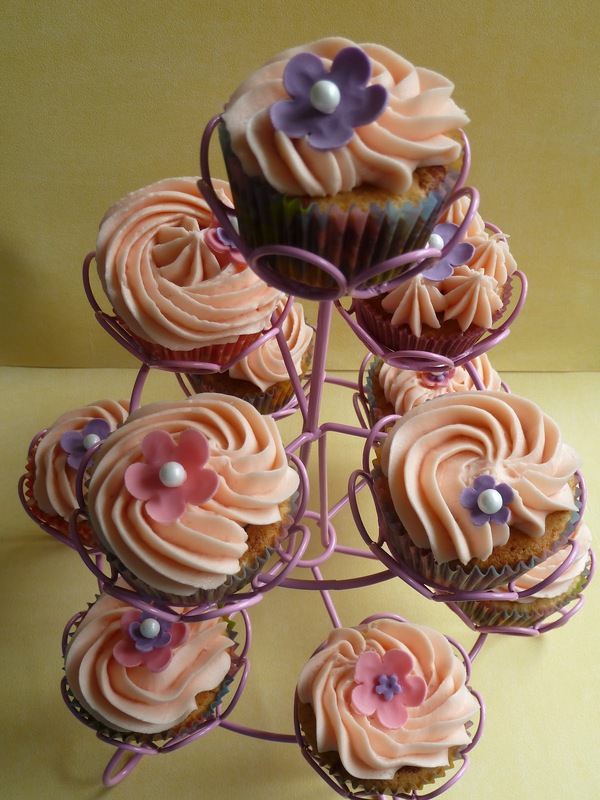 A recipe from Honey and Rose cakes. I've never baked with honey before, so was rather anxious working with this sweet goopy syrupy goodness. It was also the first time I have used the bottle of rose water I bought a month ago. This recipe is heavy on the honey and as such I think it over powers the rose water. It still tasted lovely, but I think you could get away without quite so much honey. You will also notice that there is no sugar in this recipe, all the honey replaces the need for sugar. Whisk the eggs until light and fluffy, stir in the rest of the wet ingredients. Then add the dry ingredients, combining thoroughly. I whisked the eggs separately for a good 3-4 minutes to get as much air into the mixture as possible, as I was worried the honey would make for a heavy cake. But it turned out fine, it did not have a super rise to it but it was light enough. For the topping, mix the butter and icing sugar together, then mix in the rose water. Pipe or spread onto the top of the cakes. I've also been busy making sugar paste flowers to decorate the cakes. I'm submitting this recipe as part of May's AlphaBakes Challenge on The More Than Occasional Baker and Caroline Makes blog of which Caroline is this months host. This months letter is 'H' for Honey and Rose Cakes. 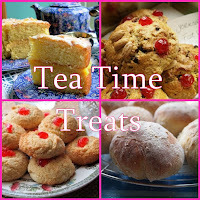 I'm also posting this recipe as my entry into May's Tea Time Treats Challenge, the theme this month is floral. I think the flower covered rose water flavoured cakes should tick the box. Hosted this month by Karen at Lavender and Lovage and Kate at What Kate Baked. Honey can overpower flavours so easily, but they look absolutely beautiful and I bet they taste pretty special! Beautiful cupcakes. I know what you mean about the honey overpowered the taste but a good recipe nevertheless. 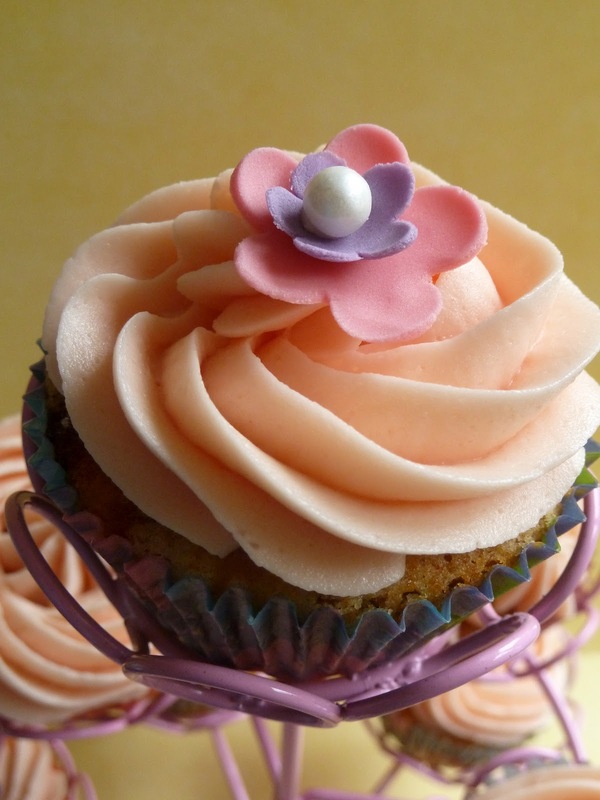 They sound absolutely delicious and they look so very pretty - beautifully decorated. I love honey in cakes, but it is a strong flavour and there is an awful lot of honey in those cakes. the honey cakes I made recently were with a mixture of sugar and honey, which gives the flavour of honey, but not an overpowering one. Lovely little cupcakes, honey and rose sounds delicious!! I've never tried honey in a cupcake before! I think I'm goint to make similar cupcakes for Teatime treats too...if I can find the time!! These honey cupcake are very pretty! Honey and rose sound like a delightful combination! Thanks for entering these beauties to AlphaBakes!